A giant pancake-like structure made of dwarf galaxies has been spotted orbiting the Andromeda galaxy, the nearest neighbor of our own Milky Way, researchers say. A similar galactic disk, which current galaxy formation models have trouble explaining, may even exist around the Milky Way, too, scientists added. The Andromeda galaxy, named after a mythological princess, is a spiral galaxy much like the Milky Way. 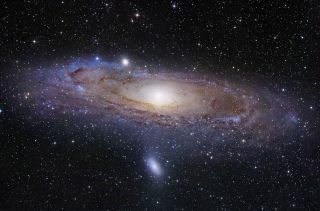 At about 2.5 million light-years away in the Andromeda constellation, it is the nearest spiral galaxy, and is the most distant object in the sky that one can see with the unaided eye. Andromeda and Milky Way are each surrounded by a swarm of smaller galaxies. These dwarf galaxies, which seem rich in mysterious, invisible dark matter, appear to each be about 10 million to 100 million times the mass of the sun, while the Andromeda and Milky Way each total nearly 1 trillion (that's 1 million million) times the mass of the sun. Now Martin and his colleagues find that about half of Andromeda's 27 known dwarf galaxies are apparently arranged in a disk around it spinning in the same direction as Andromeda. These 13 ball-shaped dwarf galaxies make up a pancake-like structure less than 42,000 light-years thick that extends at least 1.3 million light-years away from Andromeda. This composite shows the alignment of the satellite dwarf galaxies of the Andromeda galaxy, in relation to the view that we see from Earth (the top left panel shows a true color image of the center of the Andromeda galaxy taken with the Canada France Hawaii Telescope). Image released on Jan. 2, 2012. The astronomers detected the disk using the Canada-France-Hawaii Telescope in Hawaii as part of the Pan-Andromeda Archaeological Survey. So far, it remains uncertain if current models of galaxy formation and evolution can explain the existence of this vast disk. Dwarf satellite galaxies are thought to be remnants of the material that came together to form the giant galaxies they surround. While it makes sense that a disk of such dwarfs might emerge early after they formed, after a few orbits these dwarfs should veer off and live relatively independently, dispersing the disk in the process. "Either something about how these galaxies formed or subsequently evolved must have led them to trace out this peculiar, coherent structure," Martin told SPACE.com. "Either way, we do not understand the reason for this structure, making it very exciting." "The presence of this thin, rotating disk of dwarf galaxies around Andromeda suggests a strong connection between the host galaxy Andromeda and its satellites," Martin added. "There is currently no satisfactory scenario that can explain all the properties of the satellites in the disk, but they all require a strong interplay between Andromeda and the satellites themselves." Critics might wonder if these dwarf galaxies are coincidentally moving together, and only seem to make up a disk. "It could be argued that we are seeing a statistical fluke, but this would be an exceedingly rare statistical fluke indeed — about one chance in 10,000," Martin said. Other mysteries abound regarding this new discovery. For instance, this disk of dwarves appears tilted at about a 50-degree angle in relation to Andromeda's disk. It is unknown why that is. "It may relate to the dynamics of the process responsible for the creation of this rotating disk," Martin said. Intriguingly, the Milky Way's pole apparently lines up with Andromeda's disk of dwarf galaxies. It remains unclear why that is as well. "It may indicate that the Milky Way is somehow involved in the shaping of this plane of dwarf galaxies, but it could also be a chance alignment," Martin said. In addition, about half the remaining dwarfs orbiting Andromeda, which lie above the spiral galaxy, also seem to make up another disk. This one seems tilted by about 13 degrees in relation to Andromeda's disk, said Brent Tully at the University of Hawaii, who did not participate in this study. The researchers now hope to investigate the properties of dwarf galaxies in this disk to look for any differences from dwarf galaxies outside the disk that could enlighten them on the disk's origin. They would also like to see if similar disks exist around other galaxies to check if they are common features of galaxy formation. The scientists detailed their findings in the Jan. 3 issue of the journal Nature.